Midget - We helped this adorable FeLV+ kitten with a broken leg find a safe forever home at a sanctuary in 12/08. Which is more beautiful, feline movement or feline stillness? CALLING ALL WRAPPERS! - CR!FR will be at Borders Books this year for the Holiday Gift Wrapping Program. We'll staff a gift wrapping table & wrap customers' purchases for tips. 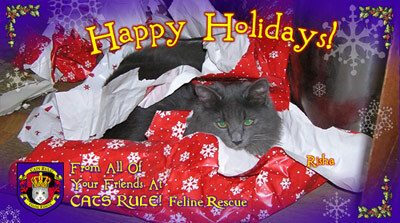 If you'd like to wrap prezzies to help raise funds for CR!FR's kitties & rescue efforts, please join us! The schedule's been divided into 2.5-hour shifts. No supplies required, you need only to bring yourself. Click here for the shift schedule. Hope you can join us for some fun, socializing, & fundraising for the animals! We have some fabulous new items on sale, including lots of new magnets - 60+ designs total! Save on shipping, buy in person :) All proceeds directly support our life-saving work. We always have plenty of free literature on animal issues for you as well. October-November — Whew, it has been a madcrazybusy fall season! We did 5 weekend events in a row & had a great time. We got drizzled on, rained on, & poured on but it was still fun & always great to meet other animal people. December — Now on to the Holidays! We have our popular Kitty & Doggie Wreaths as well as lots of other fabulous new merch, for all the animal lovers on your holiday list. Check out our beautiful Key/Leash Racks. We now stock around 60 different magnet designs & the number keeps growing. Photos to come asap! Please come visit us at the Earth Day/Arbor Day Festival at Northern Va Community College (NVCC) this coming Saturday, April 25, from 11am-4pm. We'll have some neat new items for sale & plenty of free literature ~ raising funds for new cats' & kittens' vet care/expenses & Ellie Mae's spay! 04-15-09 — A handsome grey cat was brought to our vet by a caring couple who saw him hanging around their condo complex for several weeks. They couldn't locate an owner, so this beautiful sweet fellow is now with us & we're going to help him find a loving forever home! Click here to meet F. Cat Fitzgerald. 04-05-09 — Newcomers in! We welcomed 3 cats & a big puppy from Prince George's County, MD's shelter today. Thank you to Lisa Marie for bringing them to us! Two of the cats are sick with URIs, 1 is pregnant. We'll give them lots of TLC. The puppy is a hoot, she's around 6 mos old & already huge! And very sweet & affectionate, too. To meet Ellie Mae, click here. See Bocco & Dillon's listings on www.Petfinder.com to find out more! Tune in this Sunday, March 29th, at 4:30pm ET/PT to watch Food Network's "Will Work for Food" hosted by Adam Gertler. Adam visits The Honest Kitchen in San Diego, Calif., where he whips up healthy dog food from ingredients FDA-approved for human consumption. Based off the traditional Thanksgiving dinner, the canines (and Adam) gobble up his tasty concoction. We hope you enjoy it! ABC Correspondent Sharyn Alfonsi & investigators from Nightline travel the byways & back roads of Lancaster County, Pennsylvania - visiting numerous puppy mills & filming Main Line Animal Rescue's volunteers as they rescue breeding dogs & puppies from Lancaster County's notorious Amish commercial breeding facilities. This promises to be a very special program. If you are involved in rescue, advocate on behalf of the millions of puppy mill dogs interned in our nation's commercial dog breeding facilities, or if you just simply love animals, you will not want to miss this. Sharyn Alfonsi interviewed, on camera, an Amish breeder while touring his facility - a first for network television. With approximately 500 dogs housed on his property, this commercial breeder speaks openly about an industry cloaked in secrecy & suspicion - the cruel factory farming of man's best friend. It has been almost one year since Oprah's puppy mill show aired. That program received the highest viewer response of any Oprah Show in years. Now we need to spread the word about this very special Nightline. Only by educating as many people as we can, will we be able to help these animals. And after you watch the program, please don't hesitate to contact ABC & Nightline to thank them for casting such a strong light on the plight of our nation's puppy mill dogs. 03-26-09 — Lisa Marie, a friend & wonderful rescuer, invited our Director to write a Q & A piece on TNR & feral cats for her DC Examiner page. Click here to read the article. * Receive a kitten care manual that you will use as a reference tool all year long. Class: 11:00 a.m. - 4:00 p.m. Cost: $25 per participant for the manual & class materials. Please email kittenmom@cox.net to register. - This is a must-attend course for all shelter employees & rescue volunteers who will care for kittens & cats this year. Rosemarie Crawford has nearly a decade of experience working in animal welfare, specializing in the care of young kittens with special medical needs. Before moving to Virginia, she worked at the Champaign County Humane Society, a high-volume, open-access shelter in Illinois. young kittens when at home in Virginia. Susan Spaulding has more than 20 years of experience fostering felines. She has spent the last 15 years specializing in care for neonatal kittens too young or too ill to survive on their own. She cares for orphaned neonates & critically ill kittens for more than 30 animal rescue organizations & fosters special needs kittens for animal shelters from Georgia through Pennsylvania. She has worked with veterinarians to develop cutting edge protocols for the treatment of URIs & pneumonia in neonatal kittens & produced the first "Feline Neonatal Kitten Care" video distributed nationally by Alley Cat Allies. She speaks monthly about triage care for neonatal kittens at the Fairfax County Animal Shelter's Helping Community Cats classes. Susan literally saves hundreds of kittens each year by caring for them temporarily until they are weaned or well enough to be transferred to other fosters to await adoption. The Fairfax County Animal Shelter will host a low-cost rabies clinic for pets on Sunday, April 5 from 2 - 4 p.m. at the Mount Vernon RECenter located at 2017 Belle View Blvd, Alexandria, VA 22307. Dogs, cats & ferrets will be vaccinated at the clinic at a cost of $12 per pet. To receive a three-year vaccination, pet owners should bring proof of their pet's current rabies vaccination. All other pets will receive a rabies vaccine valid for one year. 2009 dog licenses will be sold at the clinic for an additional cost of $10 per license. Dogs must be on leash. Cats & ferrets must be in carriers. No rabies tags will be issued at the clinic. The reduced-cost rabies clinic is being hosted by the Fairfax County Animal Shelter, Deepwood Veterinary Clinic & the Mount Vernon RECenter. 03-21-09 — Happy Spring! Kitten season is right around the corner & rescuers will be more swamped than ever, combined with owner surrenders from home foreclosures. Please consider the life-saving gift of fostering. There will be mama cats with kittens, orphanded kittens of all ages, pregnant cats, juvenile youngsters, & adult cats all needing a safe temporary home. Fostering is an extremely rewarding & positive experience. Many people fear that giving up their foster to adoption will be hard, & of course it is to a certain extent. But the satisfaction of knowing you played a major role in helping that precious animal find its permanent loving home is a wonderful feeling ~ you literally gave it a second chance at life! And there are numerous more cats & kittens needing your help too, so there is no shortage of sweeties you can help. Please give it some thought; all you need is an extra room where your other cats don't go. If you don't have cats, a quiet safe corner will do. CR!FR will provide the crate, vet care, & some other supplies. You supply the food, litter, & lots of love & attention. The length of time fostering varies. 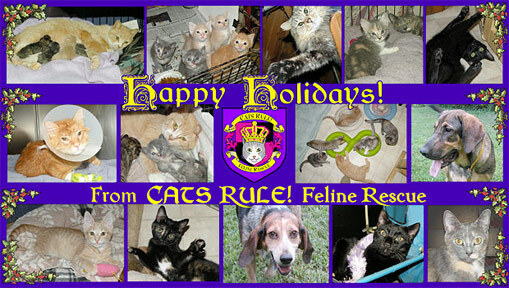 Please contact us at info@catsrule.org if you can help save precious felines by fostering ~ Thank You! . . . . . . . . .- - - . . ..
02-14-09 — HAPPY VALENTINE'S DAY! Affectionate THANK YOUs to everyone who cares for & helps needy animals, especially CR!FR's wonderful supporters! You are appreciated more than words can say. . . . . . . . . .- - - . . .
01-07-09 — HAPPY NEW YEAR! We hope everyone had a cozy & relaxing holiday! TO UPDATE THE NEWS PAGE REGULARLY! Apologies for keeping everyone in suspense all last year! It really was an overwhelming time & certain tasks just didn't get done, such as updating the website. This year will likely be just as busy but I'll make every effort to update at least quarterly. 2008 was a very busy year. The closure of the ACA feral cat clinic in January was a major setback but we strive to continue providing TNR for feral cats on a drastically small budget. We responded to requests for assistance, lent out humane traps, & guided caring people with their own cat rescues to low-cost spay/neuter clinics. We attended many adoption events & drove 6 shelter rescue transports to help get animals out of high-kill shelters to the safety of rescue groups. Our Director took 2 veterinary assistance courses through the Fairfax County Adult Education & learned a lot in these very worthwhile classes. 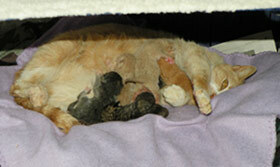 We rescued several foreclosure cats, several litters from high-kill shelters, several dogs, & wildlife. We trapped at several locations. We cared for a feral cat colony & a family of starving mangey foxes. It was a very busy year indeed! We could not do any of this without the support & friendship of our donors, friends, volunteers, other rescuers, veterinarians, & our understanding spouses. A special shout-out goes to our small but very dedicated Board who do the work of 10! We are very sad to lose our Treasurer, our can-do, right-hand person Katrina. We trust it is only temporary & that she'll be back in the spring! MEMBERS WANTED: This year we will continue our efforts to help homeless, feral, & needy cats, dogs, & wildlife, & we need more hands on deck. Please join us if you want to get involved in our organization. We have seats on the Board available for qualified people. Please contact us at info@catsrule.org. There's always plenty to do, it's a work in progress! We'll keep trying to keep up with the constant avalanche of animals needing help. Let's hope this year we'll be able to take great steps forward & grow to meet the challenge!